The 2018 World Series of Poker $10,000 Main Event is one step closer to crowning a champion and six hopefuls remain in the hunt for the $8.8 million first prize and bracelet in the second-largest ever Main Event field. 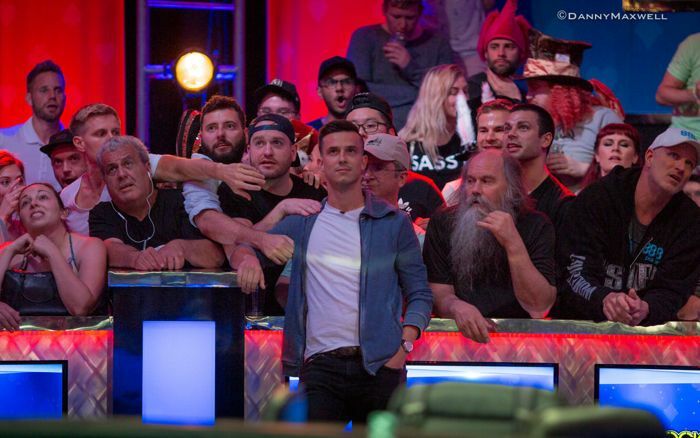 As expected, the Thunderdome was filled with plenty of spectators, with the rail of Alex Lynskey dominating the boisterous atmosphere with chants as early as 20-minutes prior to the shuffle up and deal by 2017 WSOP Main Event champion Scott Blumstein. However, unfortunately for Lynskey's rail, the Aussie, who was born in England, endured a torrid time of it and became one of three casualties in as many levels on Day 8. Michael Dyer will carry over a commanding lead into the penultimate day after bagging up 156,500,000, more than two times as many chips as his nearest rival and start-of-the-day chip leader Nicolas Manion (72,250,000). John Cynn follows in third place with 61,550,000. Tony Miles bagged up 57,500,000 after a late surge in the final level of the night and the remaining two contenders for the Main Event title include 2009 champion Joe Cada (29,275,000) and Aram Zobian (16,700,000). Day 9 will recommence with Level 38 (500,000/1,000,000, with a 150,000-ante). Dyer was seemingly cruising through the day after picking up an early pot against fellow big stack Manion. He continued to pull further away without too much resistance. Compared to previous days, he didn't change too much about his playing style. While Dyer has a comfortable lead and more chips than Manion and Cynn combined, victory is far from guaranteed and he is very well aware of that. “They all played pretty well. It was a pretty solid final table. I didn’t see any big mistakes,” said Dyer when asked his thoughts about the opposition. 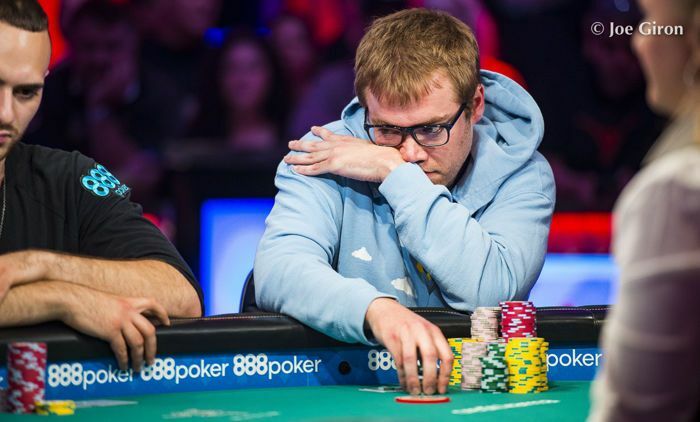 Speaking of Cynn, the US player recorded the biggest profit for the day and bagged up 62 big blinds, which was exactly what he began the day with, though he boosted his stack to 61,550,000. 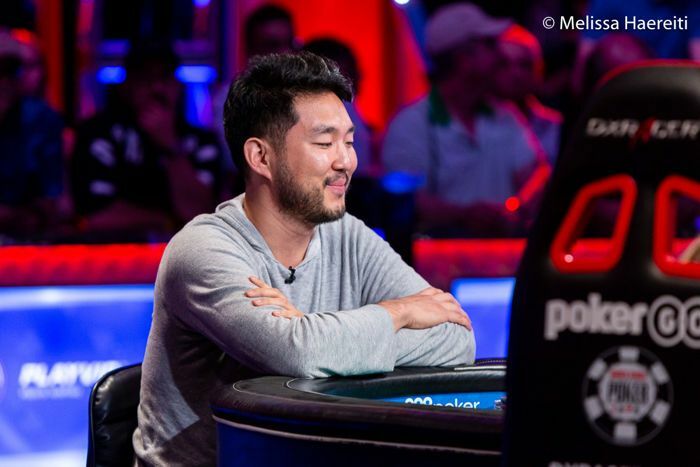 Having already come close to reaching the final table in 2016, Cynn appeared immune to a lot of the pressure, finally reaching his goal two years after his 11th-place Main Event finish, a fact he celebrated with some high fives with his rail when play ended for the day. "I got a few decent cards and I was able to play them the way I wanted to," said Cynn. "The dynamics at the table are constantly changing so I don't have a set strategy to battle constant aggression all the time. We'll see how it goes tomorrow." "We're all playing a game and we're all playing to win but it definitely doesn't seem personal between anybody. I love the atmosphere, it makes things more interesting. As opposed to sitting there and having to watch someone take twenty seconds to fold every hand, there's nothing interesting about that." Cynn won an emotional coin flip against Lynskey to eliminate the Aussie in seventh place and talked about the emotions of that particular hand. Cada: " I'm just happy to be here. It's been a grueling tournament." "I know I won the hand so I feel bad saying that it was enjoyable, but it was just an exciting hand all the way through. Even if I had lost the hand, it was such a fun hand. Just the way the board ran out, so many outs. Obviously, Lynskey is such a great guy and we can't all win but I felt good after that." Another player in the final six who knows what it takes to go deep in this very event, is Joe Cada. He will be comfortable under the spotlights after claiming the title in 2009 and he headed into Day 8 with a lot of experience under his belt. “It's been a long time so you kind of forget a lot of those feelings. I'm just happy to be here. It's been a grueling tournament. I've been lucky to even be in the spot that I'm at. I've had low chips the entire tournament so I feel like I've just been hanging in there," said Cada. Since his victory nine years ago, Cada has cemented his legacy in the poker history books by claiming two further bracelets, with one of them coming earlier this summer. 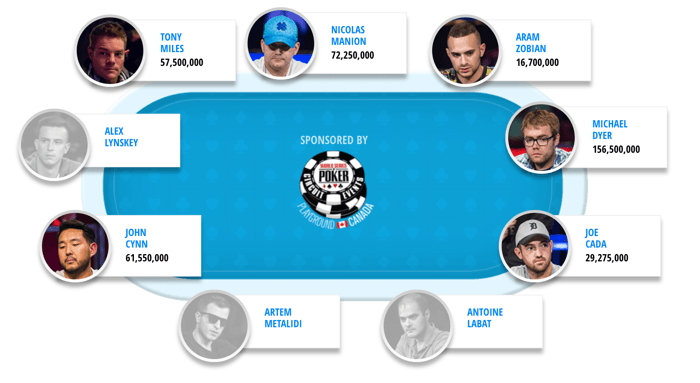 After the three-way all in to end Day 7, Antoine Labat returned as the shortest stack by far. The very same cards came to haunt the Frenchman once more to end his run in 9th place ($1,000,000). Labat got through with an open-shove once, and min-raised on the button in hand #16 soon after. Artem Metalidi moved all in from the small blind with a covering stack and Labat quickly called with two red kings. Metalidi showed pocket queens. The flop brought one of the two remaining queens in the deck and Labat became the first casualty of the day. Michael Dyer dominated the action early, further pulling away at the top of the leaderboard as play neared the first break. He won the biggest pot of the final table with ace-king, getting three streets of value from Nicolas Manion who called down with ace-queen high. Aram Zobian was the next player to end up all in and at risk when he open-shoved for 13 big blinds with ace-eight suited. Dyer looked him up from one seat over with pocket sixes and an eight on the river saved Zobian, who jumped up and celebrated with his rail. "When I hit that 12% river, it was the most happiness in one moment in my life," said Zobian. Zobian remained involved in the action just a few minutes later. Metalidi had moved all in for seven big blinds in early position and Zobian moved all in over the top out of the small blind to isolate. Metalidi flipped over pocket fives and found himself flipping against the king-queen suited of Zobian. Two diamonds and a five on the flop saw the rail explode, and a third diamond on the river improved Zobian to a flush and sent Metalidi to the rail in 8th place ($1,250,000). Metalidi: "I feel really happy and i couldn't ask for more. This way I have a desire to improve for the next year's to come." "It's been an incredible run," said Metalidi in his interview after his elimination, "I feel really happy and i couldn't ask for more. This way I have a desire to improve for the next year's to come." With the goal to reach the final six, one more player had to join the rail and that was to be Alex Lynskey. The Aussie failed to win a single pot the entire day. Despite the wild encouragement from his rail, Lynskey could not change this state of affairs after three-betting all in out of the big blind over the top of a raise by Dyer and a call by John Cynn. Dyer folded, but Cynn called with king-queen suited to take the flip against Lynskey's pocket sixes. A ten-high flop gave Cynn a gutshot, and the ten paired on the turn to give Lynskey more reason to worry. Eventually, a jack fell on the river to give Cynn a winning straight and reduce the field to the final six; Lynskey out in 7th place ($1,500,000). Play continued until the end of the level without any further casualties. Joe Cada chipped up at the very end after jamming into Dyer just before bagging and tagging. The remaining six players will return to the Thunderdome at 5.30 pm local time on Friday, July 13, to play down to the final three. The PokerNews live reporting team will provide hand-for-hand coverage of all the action, so check the live updates to stay up to date. Hand #16: Antoine Labat raised it up to 1,200,000 on the button and Artem Metalidi shoved all in for 10,300,000 in the small blind. Labat quickly called for his remaining 6,450,000 and the cards were tabled. The flop came and Metalidi took the lead with a set of queens. The turn was the and Labat was left drawing to one of two remaining kings in the deck. The river was the and Metalidi improved to a full house to eliminate Labat in ninth place. Hand #25: Nicolas Manion raised it up to 1,500,000 from early position and Michael Dyer three-bet to 3,725,000 in the hijack. 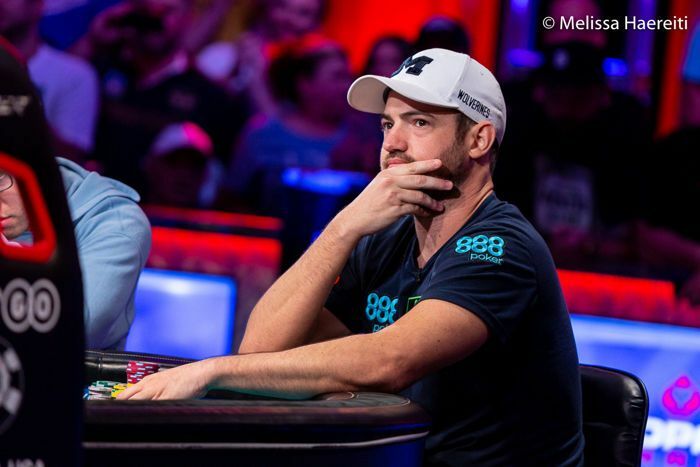 Manion called and the flop fell , which brought a check from Manion and a continuation bet worth 2,825,000 by Dyer. Manion called and a pot of almost 15 million emerged. On the turn, Manion checked once more and faced a second barrel for 4,350,000 of Dyer, Manion called. The fell on the river and Manion checked for the third street in a row. Dyer made it 6,450,000 to go and Manion gave it some thought before announcing the call. Dyer showed the for top pair and top kicker, and that won the biggest pot of the day so far, propelling Dyer into a commanding lead. Hand #34: Aram Zobian shipped all in for 10,675,000 in early position and Michael Dyer called directly to his left. The rest of the table folded and the remaining two hands were tabled. It was a coin flip with Zobian needing to connect with the board to stay alive. The flop came and Dyer stayed in front with a pair of sixes. The on the turn was no help to Zobian but the on the river was exactly what he was looking for. Zobian made a pair of eights to double up through Dyer. Hand #37: Artem Metalidi shoved all in for 6,225,000 in early position and the action folded around to Aram Zobian who re-shipped all in from the small blind. Michael Dyer folded his big blind and the cards went on their backs. The flop came giving Metalidi a set of fives and Zobian a flush draw. The turn brought the and Metalidi would need to dodge a diamond to stay alive. The river was the and Zobian made his flush to eliminate Metalidi in eighth place. Hand #47: Michael Dyer raised it up to 1,600,000 in the cutoff and John Cynn called in the small blind. Lynskey moved all in for 11,525,000 out of the big blind and Dyer asked for a count. Dyer folded, Cynn gave it some thought and called. Lynskey's rail started shouting for a six and the flop came to give Cynn a gutshot along with his two over cards. The shouting continued to the turn, giving Cynn even more outs to deal the final blow to Lynskey. With one card to come, the rails went silent for just a moment, and the river sent Lynskey to the rail in seventh place for $1,500,000. Lynskey didn't win a single hand on the day, however, the seven-figure payday will surely ease the pain. The action for the day will continue until the end of the current level or the next elimination takes place, whichever of the two comes first.